TIANJIN (CHINA) - Airbus on Wednesday inaugurated its first completion centre for large aircraft in China, a new asset for the European manufacturer in heated competition with American rival Boeing. China is one of the Western manufacturers' key battlegrounds, with its travellers taking to the skies in ever-growing numbers. In Tianjin, a port city 150 kilometres (93 miles) from Beijing, Airbus already has an assembly line for the single-aisle aircraft A319 and A320, the first of its kind outside Europe. 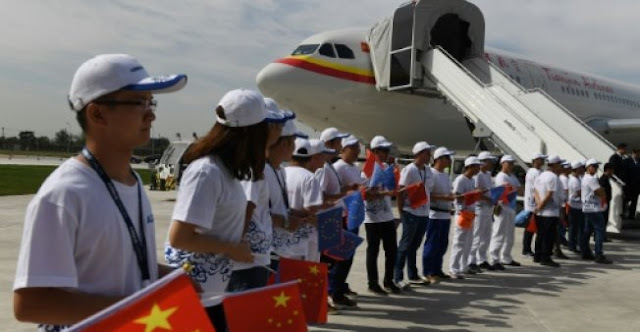 Now the same site hosts a completion centre for long-haul A330 and its first aircraft was delivered to the local company Tianjin Airlines on Wednesday, accompanied by the playing of cymbals and banging of drums. "This is the perfect illustration of mutual trust" and "our willingness to embark on a new stage in the Franco-Chinese relationship," said French junior finance minister Benjamin Griveaux, the first member of President Emmanuel Macron's government to visit China. The 200-million-euro ($240 million) facility will receive A330s assembled in France and will prepare the cabins and apply exterior painting. Two aircraft will be delivered every month. The A330, operated by nine Chinese airlines, is the most popular wide-body aircraft in the country. "The inauguration of our (centre) in Tianjin, together with the first of many deliveries, marks a new milestone for Airbus' international footprint," Fabrice Bregier, Airbus chief operating office, said at one of the site's giant halls alongside leaders of the aviation manufacturer Avic, the European firm's Chinese partner. The majority of Airbus orders in China remain its A320 single-aisle jetliner. But with about 200 A330s in the country's skies, the aircraft manufacturer also controls 61 percent of the long-haul market. According to the company, China will need about 6,000 airliners over the next two decades, and its demand for large carriers will be boosted by the explosion of Chinese passenger traffic abroad that is increasing at 14 percent per year, said Eric Chen, president of Airbus China. Having doubled its market share in the space of a decade, Airbus is now on par with Boeing in China. But the American aircraft maker does not intend to be left behind. Next year it will open its own finishing centre for the medium-haul B737 in China. For its part, the Chinese state aircraft manufacturer Comac intends to jostle the Airbus-Boeing duopoly with its medium-haul C919, which took its maiden flight in May. Airbus on Wednesday inaugurated its first completion centre for large aircraft in China, a new asset for the European manufacturer in heated competition with American rival Boeing.